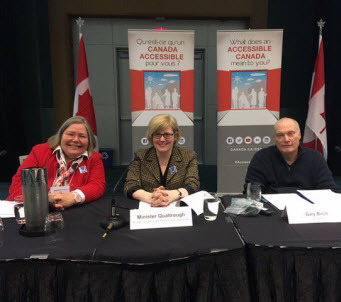 Minister for Sports and Persons with Disabilities Carla Qualtrough and her team are holding public consultations around the country and gathering thoughts, perspectives and suggestions for the forthcoming Canadians with Disabilities Act, for an #AccessibleCanada for all. Last Saturday, a public consultation session was held in Vancouver, British Columbia. I had the opportunity to share the assumptions, misperceptions and barriers that I face living with a speech disability. Click to listen to my words. Good afternoon! 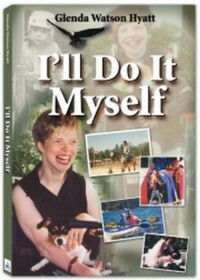 I am Glenda Watson Hyatt, a self advocate, an author, and a motivational speaker. I have both a physical, and a speech disability. Of the two, living with a communication disability, is the most frustrating and isolating. Simple tasks like inquiring about a government service, calling for a taxi cab, or even ordering a chai tea latte, can be an exasperating ordeal. Like other Canadians living with speech and language disabilities, I am often assumed to be cognitively impaired, or deaf, in which case, gesturing ensues, an impromptu game of charades. Friends with communication disabilities, have been assumed drunk, and the police or paramedics needlessly called. Our methods of communicating are often denied. For example, on one trip to the emergency room, my husband, who also uses a wheelchair for mobility, was told to wait in the waiting room, because there was not enough space for both of our chairs. We attempted to explain that, I needed him for assistance with communication, yet he was still told to leave. Imagine a person who is deaf being denied a sign language interpreter. The situation is similar, yet my need for assistance with communication, is typically not recognized. My communication access requirement is not protected. Other medical doctors have refused to speak directly with me. They do not seem to understand that, even though they do not understand my speech, I can hear them and understand them. When medical professionals do not understand, do not respect, that hearing and cognition, are not necessarily impacted, by communication disabilities, then there is little chance, the general public will understand, and respect this, without an ongoing, widespread, information and awareness campaign. This lack of understanding, of my actual disability, makes complex endeavours, like finding meaning employment, extremely difficult, if not impossible. I am struggling to get by on social assistance, not because I lack education, skills, talents, motivation, or technology to accommodate my disability. I am struggling on social assistance, because I could not find an employer, who saw beyond the assumptions, and misperceptions, of my disability. Even within the disability community, people with communication disabilities, are routinely overlooked and excluded. 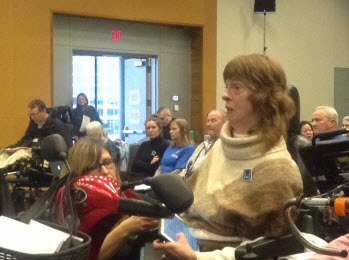 The non partisan, Barrier Free Canada, a major driving force for the Canadians with Disabilities Act, states in its principles that, “The Canadians with Disabilities Act should apply to all persons with disabilities whether they have a physical, mental, sensory, learning and, or intellectual disability, or mental health condition.” Canadians with communication disabilities, are not mentioned. What would it take to fix these barriers? Canadians with speech and language disabilities, need to be recognized, to be heard, to be included. We may not be the most vocal group, but we still need to be at the table, to be involved, and to be contributing. We need to have, our communication access requirements, acknowledged, and protected. Back in high school, public speaking was definitely not on my list of top career choices. It ranked way down near the bottom with neurosurgery. Likewise, my top career options were also rather limited. 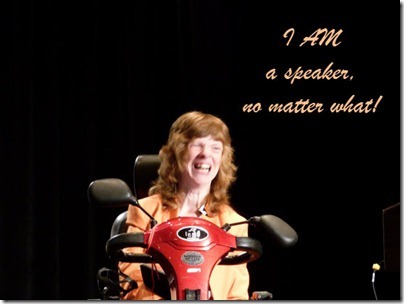 As you may know, I have cerebral palsy, which, for the most part, affects my balance, muscle coordination and speech. Back when I was searching for employment opportunities, entry level office positions – my only glimmer of possibility – required a minimum typing speed and the ability to answer the telephone. However, my left thumb – the only digit I can use for typing – did not meet expectations, and my unique Glenda-ish did not make the phone my best friend. I was disqualified from most positions before the conversation even got to my abilities, talents and interests. I persevered and some time after completing my Bachelor of Arts degree from Simon Fraser University, I did land a part-time job at my alma mater, making the existing career mentor program accessible to students and alum with disabilities; a job I loved. When the project funding ended, so did my job. After much searching, I could not find another employer willing to give me an opportunity to prove what I was capable of offering as an employee. Self-employment was my only option. I competently completed any work opportunity that came my way: writing a literature review for a homelessness project, editing sermons for a pastor’s book, writing articles for various websites, maintaining a website for a non-profit arts organization. To me, those were survival jobs – equivalent to pumping gas and waiting tables – they put some food on the table, but not much more. Gradually I built a solid reputation as a web accessibility consultant; making websites accessible to people with all kinds of disabilities. Web accessibility was an understandable career path for me and there is still much left to be done in the field but, after fourteen years, I felt so burnt out that if I had to explain the need for text descriptions of images one more time, I would stab my eyes out with a yellow HB pencil. Advances in technology – namely, the iPad and the text-to-speech app Proloquo4Text – have enabled me to take my career in a bold new direction; one that was impossible, inconceivable back in high school. That of being a well-paid, internationally-known motivational speaker to inspire people who are silently screaming “There’s more to me!” and, yet, they are standing in their own way from moving forward. In August, I traveled to Toronto for the honour and privilege of delivering the ISAAC 2016 Consumer Lecture as a plenary session at the International Society for Augmentative and Alternative Communication (ISAAC) Conference. I delivered Finding Your True Dream, The North Star for Your Life’s Journey – which has since become my signature talk – to approximately 600-800 people. Being up there on the stage, sharing my story and the five elements of a dream, felt so right. This is what I am meant to do, where I am meant to be, at this point in my life. It is a destiny I fully accept and embrace, and an irony I savour as absolutely delicious. Sometimes finding employment means daring to follow a dream, no matter what! For more information about my signature talk Finding Your True Dream, The North Star for Your Life’s Journey, please download my speaker onesheet. Feel free to share with anyone you know who is looking for speakers for conferences or events. Thanks kindly. Move Over Scissors, The Nimble is Cutting It! More often than not, using scissors when left-handed is frustrating. The scissors tend to fold paper, rather than cut it. Add in limited hand function due to cerebral palsy and some tasks, like opening a plastic package, leaves me screwed. Enter the Nimble – a cutting tool that slips over the fingertip. Right out of the envelope, I was able to use the small gadget to open the enclosed packages of the sweets. 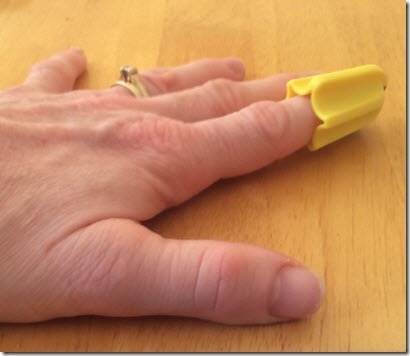 Since then I have been using the “1 finger cutting tool” to open packets in the kitchen every day. And I am constantly finding new uses for it. The actual cutting bit is like the very tip of a cat claw. Because it is so small, there is no (or, a minuscule) chance of cutting myself. Yet, it will cut what I need cutting: paper, plastic, cellophane, foil, tape, and such. I am looking forward to packing the Nimble in my bag when I head off to Toronto this summer. Scissors aren’t permitted through airport security, but this small cutting tool will likely get through without a second glance. Opening the hotel’s tiny soap bars will no longer be a hassle! The creator Simon Lyons and his company VERSION 22 are running a Kickstarter campaign to raise funds to get the Nimble into production. If you feel so inclined, please check out the Nimble’s Kickstarter campaign. I am eager to having Nmbles in several places throughout my home so that one is always handy when I need it! With headaches so painful I felt like I would puke, an optometrist appointment was reluctantly made. Reluctantly because my last appointment three years ago left me feeling devalued and depleted, and took all of my inner strength not to burst into tears. This feeling had nothing to do with the condition of my eyes, but, rather, the ill-prepared, unenlightened way the optometrist communicated with me and my jerky, constantly moving, speech impaired body. After that disastrous appointment, I wrote an letter to the optometrist and hand delivered it to the office. Even though I requested that the letter be placed in my file for next time, in preparation for this latest appointment I printed a copy to give to the next optometrist. I was somewhat hesitant to hand the letter to the new-to-me optometrist because I didn’t want to assume he was as unenlightened as the previous doctor. I then realized the exam would have more of a chance of going smoothly if I gave him a fair chance to succeed. I handed him the letter. After my eye exam on Monday, October 15th, I left the office feeling devalued and depleted. I am hoping by sharing the following information, the next exam will go smoother for both of us. As you might know, I have athetoid cerebral palsy. For me, this means I lack muscle control and coordination. My physical movements are jerky and involuntary; one body part or another is in constant motion. My speech is also significantly impaired, yet can be understood by individuals who take the time to listen. However, my hearing, understanding and cognition are not affected. There is no need to speak loudly, to repeat yourself or to use simple vocabulary for me to comprehend. Next time I will grab my iPad from my scooter basket before my scooter is moved out of the way so that I have a more effective means of communication at hand. My head control is tenuous at times. When conducting the eye pressure test and other such tests during which my head must remain still in a certain position, it might be helpful to have someone hold my head steady. My eyes closing when something is approaching is a strong, uncontrollable reflex. Repeatedly stating that I need to open my eyes for the eye drops is not productive. Perhaps another method can be found to achieve the same result. Please keep this letter in my file so that it will be handy for my next appointment. Perhaps in that time you could consult with colleagues and other optometrists for further suggestions on how to best serve patients with cerebral palsy and other neurological disorders. Working together will ensure successful care for my vision. The optometrist read the letter, thanked me for the information and proceeded with examining my eyes. He was extremely patient when my head twitched like a bobblehead that had just downed a few cups of espresso. However, perhaps “…my hearing, understanding and cognition are not affected” was not written clearly enough in the letter as he made a great effort to gesture while he was talking. He went as far as to write “2012” on a small Post-It note when he asked if my last glasses were in 2012. 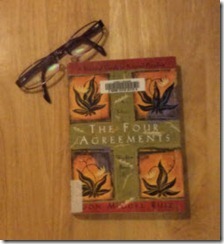 In Don Miguel Ruiz’s The Four Agreements, the third agreement is: "Don’t make assumptions." Don’t assume that I do not hear or do not understand because my speech is unclear or because I may communicate in another manner. Making that assumption really does say more about you than it says about me. And, honestly, it does not portray you in your best light. Asking me, ”Can you hear and understand me okay? Is there anything else I need to do when communicating with you?” would portray you in a much more enlightened light. On the bright side, this optometrist would make a fantastic partner while playing Charades. What Impossible Idea Would You Attempt If Surrounded by People Who Won’t Let You Fail? Gifts are wrapped. Christmas dinner for two, hopefully three, is planned. Stockings are hung. All that is left to do before I crawl into bed for a not-long-enough winter’s nap is to write to you. Except for a few bumps along the road, I have had a relatively good year. I am feeling blessed and content. There is nothing specific I would like to ask for.